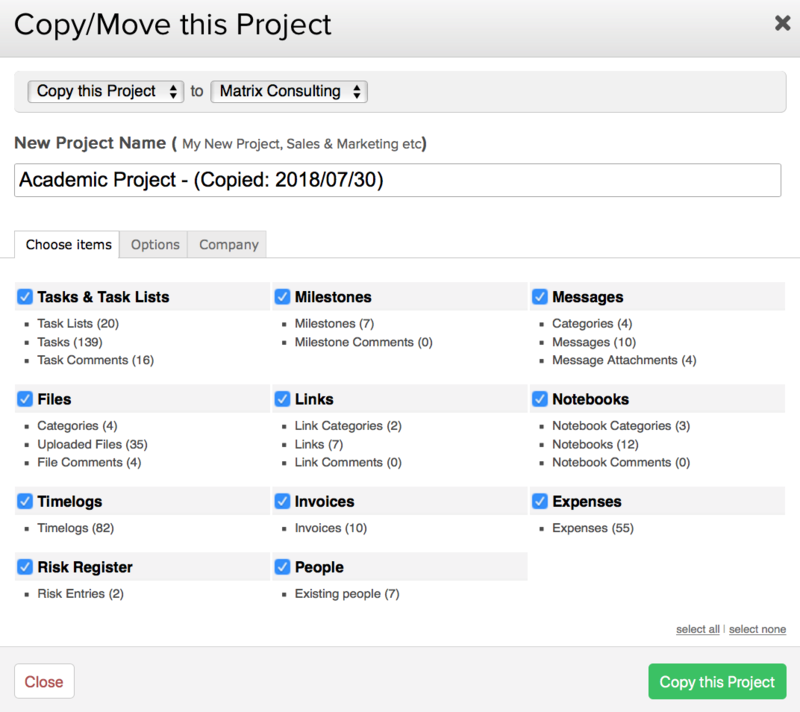 Within Teamwork Projects, you can make a copy of a project, including as much of the content of the original project as you prefer, so it's just like using an existing project as a template. In the top right corner of the project's Overview tab, click the options (three dots) button, and select Copy/Move from the dropdown menu. You can also find the copy option whenever you see the dropdown menu to the left of the project's name. When you choose Copy/Move, you will see all of the options available. If you have set up a link to other sites in your profile and you are a site administrator on both, you can choose to copy the project to that site as well as making a copy in the current site. 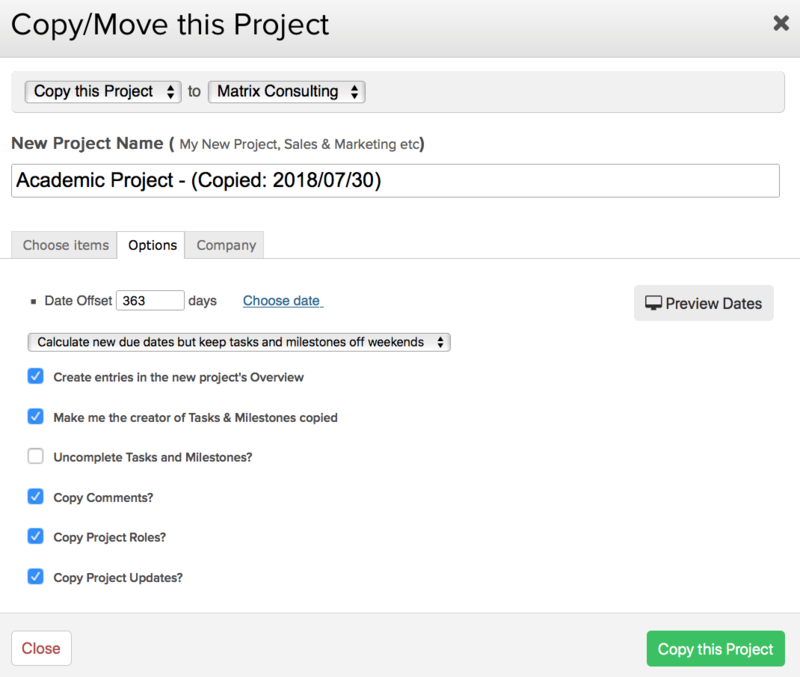 Note: The option to move a project will only be shown if your site has been linked to another Teamwork Projects site. 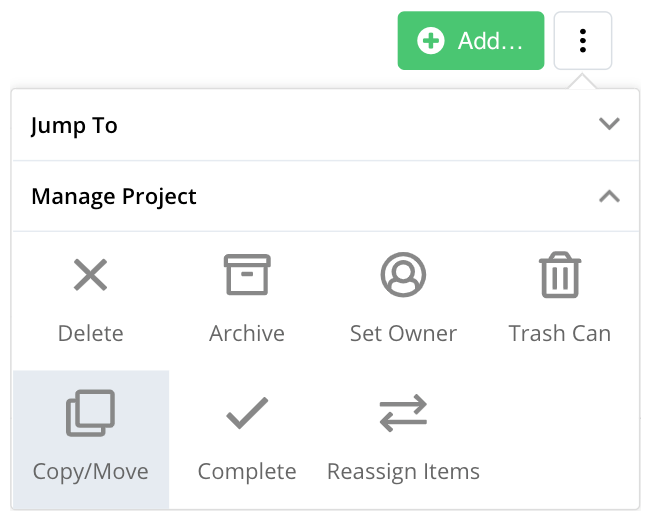 In the choose items tab, you can add a name for the copy of the project, and choose which content to copy by selecting the checkboxes next to each content type. Note: The copy project modal retains your choose items preferences from the previous time a project was copied. You will see the total number of items in the original project next to each one. Note: Users who are selected as followers on project items are not included when a project is copied. In the options tab, you can choose how the dates from the original project will be set up in the new copy. If your original project has a start date, that will be taken as day 0, otherwise the date that the project was created will be used. You can use the date preview option to see the effect of any settings chosen here, before making the copy. 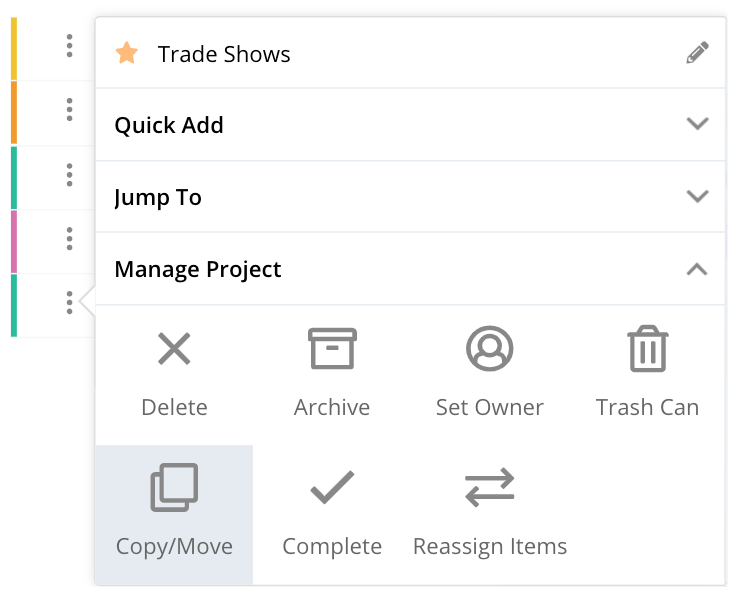 The other options allow you to control whether other elements from the original project are copied, including activity updates, task and milestone creator, comments, project roles and project updates. Completed tasks can be copied with their completed status, or marked as active again. 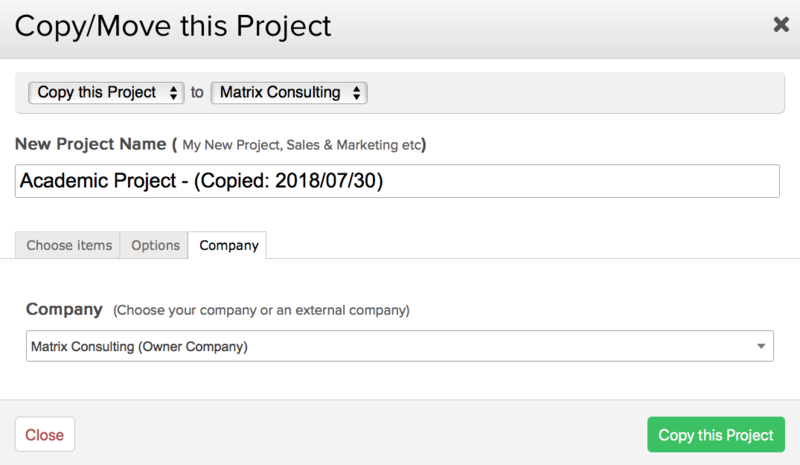 In the company tab, you can choose to associate the copy of the project to a different company than the original project. When copying a project, you can choose to exclude weekends by selecting Calculate new dates but keep tasks and milestones off weekends in the Options tab of the copy modal. By clicking Preview Dates, you can see the number of days any affected dates will move forward based on your choice to avoid dates landing on a weekend day (denoted in red). As an example, task A starts on Day 1 and is due on day 13. Add the task on a Monday (day 1). Calendar: Mon | Tue | Weds | Thurs | Fri | Sat | Sun | Mon etc. Calendar: Mon | Tue | Weds | Thurs | Fri | Mon etc. Saturday and Sunday have not been included in this calendar count. You can set up some projects that you would like to use as templates for future projects. You can then utilize the copy project feature, creating new projects as a copy of those templates, rather than new blank projects.